As the end of May and beginning of June role around, graduation season is in full swing! Graduation parties thrown by the family of the grads are a great way to celebrate. No one wants to have a lame grad party and adding small details can help your celebration be unique. Wether you are graduating high school, college, or even middle school here are some cute tips you will want to steal for your grad party ideas! Decorate a vase or large mason jar with glitter, ribbon, and a sign saying “memory jar”. Leave colorful pens or markers along with small pieces of paper with the jar. Instruct guests to write their favorite memory with the graduate. This decoration is a great way to keep guests entertained, spark nostalgic conversation, and give a keepsake to the grad. This is definitely one of the cutest grad party ideas! Decorated flute glasses with candy are an affordable yet chic way to add sweets to your party. Buy plastic flute glasses from your nearest grocery or party store. You can the decorate the glasses with paint, glitter, and stickers. Add candy to the flutes and then top them off with a paper cap. Use these fun glasses at the party or as a party favor for guests. Hand out these sweet diplomas to all your party goers. Simply wrap Pirouette cookies with a colorful ribbon and you are ready to go. These are a great solution if you are working on a small budget and have little time to decorate. These are not only delicious but unique grad party ideas to make yours stand out! Celebrate your year of new beginnings by welcoming guests into your party with a large tissue paper sign. Cut out large numbers, of your graduation year, then paste on tons of small piece of tissue paper. You can then glue the numbers onto sticks and prop each sign up in a bottle or vase. These colorful numbers will be a perfect backdrop for your grad Instagram photos. If you have a staircase in your home, take advantage of your extra space and add some memories to your banister. Alternate colorful ribbons and chains of old photos on the railing of your stairs. Guests will love to see how far the graduate has come and photos are a great visual representation of growth! Who says your silverware can’t also be fancy for a party? Similar to the diploma cookies, wrap a ribbon around your napkins. These are not only a cute way to decorate your party but also an awesome way for guests to carry their silverware around easily. Snap cute photos of your party guests with a polaroid camera. Make sure to stick each photo in a guestbook or journal as well. Party goers can also sign next to their photo, similar to a yearbook. This is a great way to have a tangible guest list and photo album from your big day! When classmates join you at your party make sure to give them a class ring. Provide unique class rings by creating a display of ring pops. Choose your favorite flavor, put on a ring, and spend the evening sucking on your pop as you celebrate completing another few years of school. For a glitzy grad party add these centerpieces to each table. Dip the bottom of each mason jar in glitter and then seal it with mod podge. Include tulle puff balls, ribbon curls, and a sign of the year in your centerpiece. If the graduate is a super glamorous lady these decorations are perfect for her. Reminisce on childhood memories and even more recent ones with an adorable picture board. This project is also great because you can make it a time to bond with your loved ones while you create it. Print out photos, glue them to a foam core board, and then tack on letters and scrapbook stickers. Decorate your picture board to match your personality or future school’s colors. This is one the cutest and easiest DIY grad party decor ideas! DIY this tasteful and simple garland. Make one with a fun pattern or some school colors. If you have a mantle that is a great place to hang a garland. Before guests leave, have them write a piece of advice for the graduate. Encourage them to dig deep and think of smart tips for the student’s future. A nice way to display this is in a vintage suitcase with an advice banner. Don’t forget to put markers and paper out with this wonderful parting gift. Indulge in a full cookie bar for the smartest cookie around, the graduate. Guests will love this sweet treat and funny decoration. These cookie bars are perfect for fun grad party food ideas! Encourage party goers to share beautiful Insta pics of your get together. Come up with a catchy hashtag and make sure guests use it when posting photos. To create a nice sign use a fancy font and paint a wooden frame. For anyone that missed the actual graduation, commemorate it by displaying the cap and gown on a dress form. This is a great way to welcome people into your party. Don’t forget to snap a photo with this lively display! A nice way to add some pizazz to your party without too much effort is a subtle cake topper. For a more preppy feel go for a calligraphy cake topper. Another way to serve cake at your grad party is through a good old cupcake. Cut out large numbers from foam core and then place your cupcakes on top. Make sure to frost each cupcake so this display looks extra yummy. This is another one of the best unique grad party food ideas you can do! Allow guests to drop off cards for the grad in a DIY card box shaped like a cap. Cards are often given at graduations because they are a great way to gift money while still writing a personal note. This card box is easy to build and will ensure no gifts get lost. What’s a good graduation party without some good pics for Insta? Set up a designated are for photos by creating a beautiful backdrop. Some great ways to create a backdrop is with wood planks and some streamers or even just with some lanterns and props. Don’t forget to use your custom hashtag in your pictures. Channel your inner Kardashian and celebrate like Kris Jenner does with foil balloons. Gold and silver foil balloons are an amazing prop for photos. A graduation party is not complete without foil balloons. Do you have any other cute grad party ideas!? Share in the comments below! This is a sponsored post. All opinions are my own! 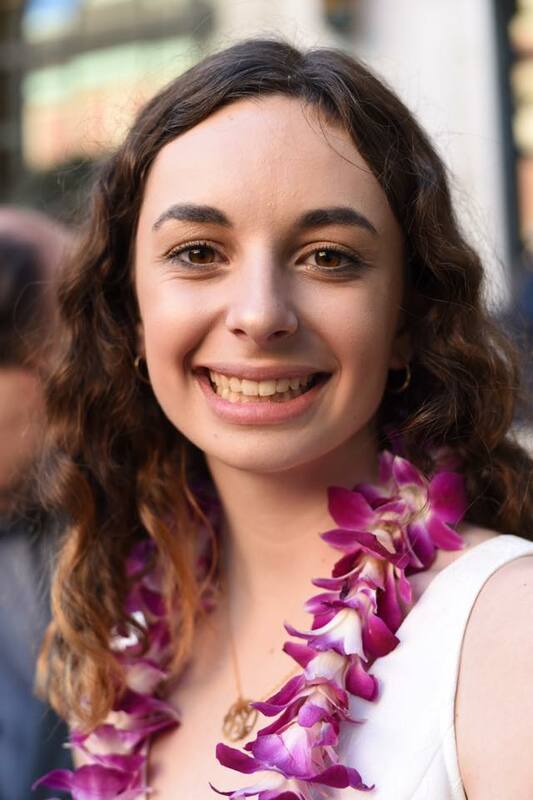 Isabella was born and raised in San Francisco but will be a member of the class of 2021 at the University of Kansas. She is majoring in political science and hopes to pursue a career in policy. She hopes to rush a sorority and cheer on the Jayhawks at every game.